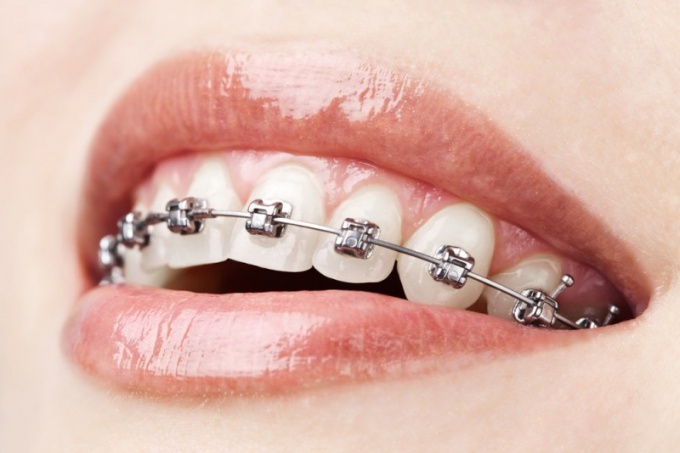 Traditional braces are pretty robust structures that are designed to correct bite and dentition. Patient they deliver a lot of inconvenience, discomfort, difficulty in the implementation of masticatory reflexes while eating and discomfort when cleaning the mouth. To avoid these difficulties by using self-adjusting braces. One of the main differences self-adjusting braces – no massive gum cause discomfort to the patient. Such structures are light and easy to use. Self-adjusting braces can be assembled on the teeth in accordance with individual differences. The specialist determines the correct position of the tooth and adjusts the clip along a certain trajectory. Unlike conventional braces, self-adjusting design greatly reduces the strain on the gums and teeth. Their effect is almost not noticeable. The treatment process is reduced by almost 30% for its duration. Traditional braces are often broken when violations of the rules of operation. Intelligent designs have a high elasticity, so they are more difficult to damage. Self-adjusting braces are of three types: metal, ceramic and combining metal and ceramics. The main difference between these structures lies in the cost of installation and aesthetics. Ceramics are almost invisible on the teeth, metal braces can cause some complex patient. Conventional braces are attached to the teeth with massive hooks. This design becomes the cause of a prolonged habituation and adaptation. Self-adjusting braces fixed to the teeth by means of special clips. Pain or discomfort the person is not experiencing. In the presence of periodontal disease traditional braces are contraindicated. Intelligent design have virtually no restrictions to the installation and wearing. A special kind of self-adjusting braces are lingual design. Such fixing means are attached not to the outside of the teeth, and on their inner side. Externally, these braces are almost invisible. In rare cases, for proper installation of conventional braces may require the removal of some teeth. Intelligent design can be attached to any number of teeth. Unnecessary suffering of the patient experience is not necessary. Invented self-adjusting braces were in the United States. Due to its characteristics and ease of application, these designs almost instantly became popular all over the world. Self-adjusting braces are often called "self-ligating". This is due, primarily, with the lack of solid attachment that is called "ligature".